From 1637 to 1660, the Scots witnessed rapid and confused changes in government and violent skirmishing, whilst impassioned religious disputes divided neighbours, friends and family. 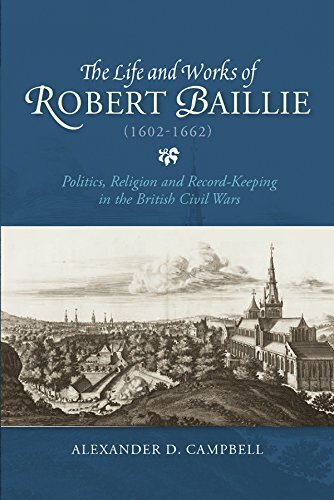 One of the most vivid accounts of this period may be found in the letters of the Glaswegian minister, Robert Baillie; but whilst his correspondence has long featured in historical accounts of the period, the man behind these writings has largely been forgotten. This biography draws together for the first time an analysis of Baillie's career and writings, establishing his significance as a polemicist, minister, theologian, and contemporary historian. It is based on the first, systematic reading of Baillie's extensive surviving manuscripts, comprising thousands of leaves of correspondence, treatises, sermons, and notebooks. Chapters address Baillie's writings on monarchy, church government, Reformed theology, liturgical change, Biblical scholarship, and Baillie's practice of record-keeping. Overall, the book challenges prevalent understandings of the intellectual landscape of Covenanted Scotland, situating Baillie and his contemporaries on the peripheries of a dynamic, European Republic of Letters. Alexander D. Campbell is Social Sciences and Humanities Research Council of Canada Post-Doctoral Fellow, Queen's University, Canada.